The Sawdust City Brewing Co.: All Aboard! Next Stop Uranus! All Aboard! Next Stop Uranus! As January wraps up a new month beckons as does Sawdust City's next beer release! That's right folks our first seasonal has been packaged into cask, keg and bottle and is ready for it's maiden voyage. Long, Dark Voyage to Uranus is all set to hit the streets, so get it while you can cause there isn't much of it to go around. We made a very small batch, only 500L of this luscious Imperial Stout was created, so keep your eyes out for it as it will soon be gone and it might be a while before it makes it's return. It's a long way to Uranus don't you know. 8.5%, 85 IBU and 2.57billion SRM, this decadent treat is loaded with rich, sinful flavours of chocolate and espresso. It has a big bitter kick though, so approach with caution...this is not for the faint of heart. 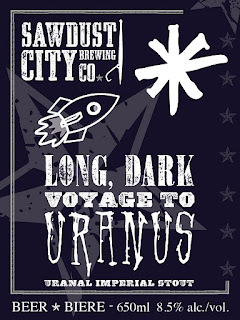 Long, Dark Voyage will be at awesome beer bars around Toronto starting next week. Look for it at barVolo, Burger Bar, Smokeless Joe's to name a few. We're also branching out to the further reaches of the province as we will be sending our first few kegs out London way to be put on tap at the Gambrinus Bistro & Cafe. A great beer bar, Sawdust City is happy to be able to find another home away from home, so thanks to Milo's and the rest of the crew at Gambrinus. Of course, you'll also be able to find Long, Dark Voyage at our second home...the mighty Griffin Gastropub in Bracebridge, ON. Re-opening on the 26th of January, the Griffin will be sporting a new look for the new year. So come out and see what's changed and try a few pints while your ate it!